At our dance studio in Houston, our goal is to help you have the wedding dance of your dreams. 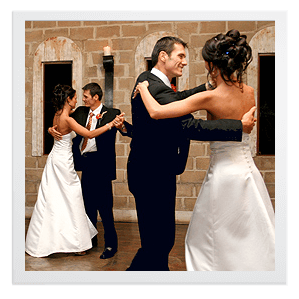 We offer wedding dance lessons in the Bellaire/Galleria-area tailored to you and your song. Your first dance together as a married couple should be special. Whether you plan to keep it simple or spice it up a little, we can make it happen. Be sure to pick your song and plan to start your lessons several weeks prior to the wedding. We usually suggest anywhere from 3-5 lessons depending on the dance you want to do and how long it might take you to learn it. Whether you want to learn just a few steps, a short routine, or an entire choreographed wedding dance to the song of your choice, we can help you make it fun and memorable. If you’re debating between a couple of songs and can’t decide, tell us what they are and we can advise you on what dance styles may or may not work with those songs, how easy or difficult it may be to dance to, and hopefully we can help you make your decision. We also offer father/daughter wedding dance lessons and mother/son wedding dance lessons. Make your day one to remember! Will you be able to raise your arms above your head? Is the dress bustled high or does it trail on the floor? Will the dress restrict the movement of your legs in any way? Is your dress a ballroom style cut with a full skirt (petticoats)? Click here for a list of suggested First dance, Father/Daughter, and Mother/Son Songs. Private Wedding Dance lessons are scheduled by appointment only. The current rate for one private dance lesson (45 minute session) is $95. 10 or more lessons are $90/session. All lessons must be paid for at the time that you book them. We work by appointment, and it can be very difficult to rebook hours, so if you cancel a lesson with less than a 24 hours notice, you will be charged for that lesson unless it is an emergency. We only offer refunds for special circumstances.